The first Dairy Cattle Congress opened at Waterloo on October 10, 1910. The responsibility for the success or failure of the show rested largely upon the shoulders of Hugh G. Van Pelt, general manager of the first five Dairy Cattle Congresses. Both local and out-of-town manufacturers were urged to exhibit their products. Breeders and dairymen from far and near were importuned to enter their stock. 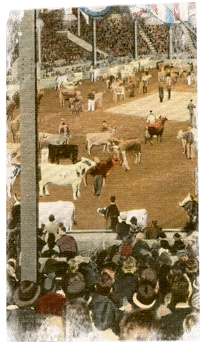 Van Pelt history-03himself went to the Illinois State Fair at Springfield and secured “A special train which brought 13 carloads of the choicest cattle” directly to the Waterloo show. Since the inaugural event was not a corporate entity, it was doubtful whether Waterloo would secure the 1911 meeting of the Iowa State Dairy Association. When officers met in the spring of 1911, they had practically decided to hold the convention in Des Moines. Harry E. Kiester made a bid single-handed and convinced them that Waterloo was the best place in the state for them to meet. Waterloo businessmen offered to assume “all responsibility” for both the convention and the show. Finally, Waterloo put up from $6,000 to $8,000 in cash prizes for dairy cattle and butter. The prize money was said to be the largest amount ever offered in the United States for a similar event. In August of 1913, “The Dairy Cattle Congress” was incorporated as an independent organization “to conduct expositions, fairs, shows, entertainments and displays; to promote dairy and agricultural interests in general; and to carry on such other business” as might be determined by a board of directors consisting of nine stockholders elected annually. Other eventful years included 1925 when a windstorm destroyed three original wooden barns shortly before the 1925 show. The John G. Miller Construction Company rallied all stone masons, bricklayers and carpenters in town and within one week, the wreckage was replaced with the brick barns still standing today. In 1927, the show was rained out. During the early 30’s the Cattle Congress fell under the blows of the Great Depression. During 1937, the Industrial Exhibition Building was destroyed by fire. 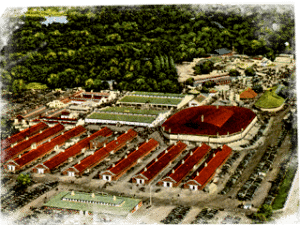 In 1942, the Iowa State Fair and other local fairs were canceled for the duration of World War II. In 1943, 1944 and 1945, the Cattle Congress “kept alive” by providing a home for the Iowa State 4-H Dairy Club Show. Following the war, the Cattle Congress entered the greatest seven-year period in its history. Profits twice as large as its prior best years stimulated another building program. Maurice Telleen, past manager of the Waterloo show, stated that the National Dairy Cattle Congress was not “National” anymore, but regional. There are several reasons for this change: shipping cattle for long distances by rail had become economically prohibitive and, in the days of curtailed rail service, geographically impossible. 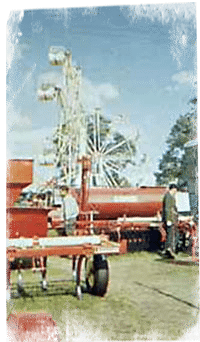 The Dairy Cattle Congress became a regional “wind-up” show usually held history-04in late September, after the state fairs were over. Exhibitors look upon the Waterloo show as an opportunity to have their local champions compared with other local champions. Whatever memories of this annual event stir within all of us, one thing is clear; The National Cattle Congress will continue to bring the best in agriculture, livestock, entertainment and education to all of Iowa and the Midwest.